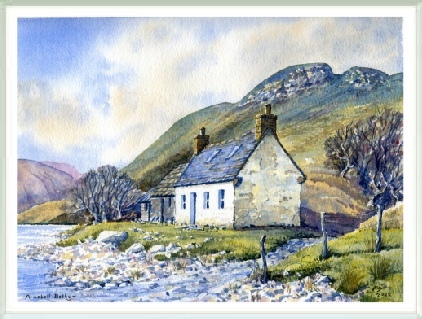 The wee bothy of Arnaboll stands beside Loch Hope and marks the location of a small settlement that stood on the main route between the Kyle of Tongue and Loch Eriboll before the tarmac road came into being. A walled cemetery stands on the hillside above the cottage, close to the ruins of the main part of the hamlet. Alongside Loch Hope, more ancient remains in the form of burial mounds mark even earlier settlements. Today, the cottage is maintained and used by Durness Primary School, giving modern children a chance to experience a simpler and more energetic way of life.